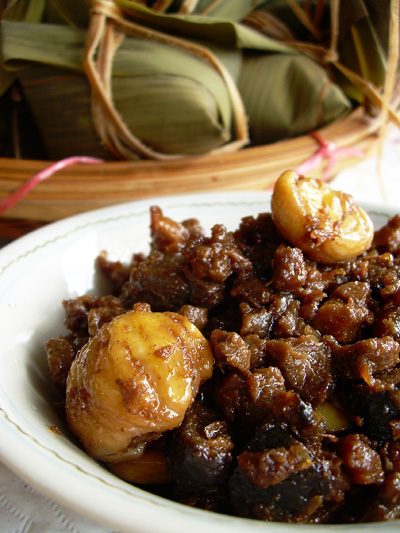 Bak Chang (or Zongzi), meat enclosed in glutinous rice filling, is traditionally eaten in June for the Chinese. It stemmed from the Dragon Boat Festival which falls on the fifth day of the fifth month of the Chinese calendar, to commemorate the death of Qu Yuan, a famous Chinese poet from the kingdom of Chu who lived during the Warring States period. Of course, in this day and time, eating Bak Chang is more of a “seasonal food” though it is not uncommon to see Bak Chang being sold all year round. I have been brought up to eat Bak Chang made by my parents and for me, our homemade Bak Zhang is incomparably delicious. Many of our relatives will ask for a couple of these southern-styled Bak Zhang whenever they hear my parents making them. Our family Bak Zhang is closely related to the Nyonya Bak Zhang in taste though the presentation is a little different. The pork is cut into bits rather than cubes (which are more common with Cantonese-Styled Bak Zhang) and freshly-toasted coriander seeds (also known as Ketumbar) which are blended into powder are used. Just like our family Popiah recipe, our Bak Zhang recipe is also lengthy and labourious but the hardwork comes with immediate satisfaction as these delicious dumplings are savoured over a cup of chinese tea. When I was in my teens, I could eat about 4 of these Bak Zhangs in one sitting! There were even times when I had them for breakfast and lunch and had to be stopped from eating them for dinner on the same day because mum was worried about my over-indulgence! Anyway, this will be a 3 part series on Bak Zhang. Following up from this post will be an exclusive video on wrapping Bak Zhang expertly performed by my parents. It’s nice to see my dad and mum combining their skills to create these delicious Bak Zhangs. The finale will be the unveiling of our family’s secret recipe for bak zhang in the hope that it can be passed on to the rest of the world. So, do watch this space! I love homemade zong zi as well. I could probably eat it breakfast lunch and dinner if only it were available all year round (or if my mom had the patience to make it for me). I love my zong zi with hazelnut and dried shrimp. It just tastes so good. Wuah….so exciting! Sure to stalk you. Hey, I got one pic *there*! The karn sui chung pic? Thanks! I have not had bak zhang for 2 years now. Miss the home-made style BZ. The pic you have posted looks good, let me wipe the drool off my laptop. Looking forward to the remaining posts. Anything home made is always a better choice. I just had my first dumpling yesterday, nonya zhang to be specific. Your bak zhang filling looks so delicious. Dan : Hazelnut? Not chestnut? Hmmm…that’s unique! Lilian : I like suspense, do you? LOL! This is one of my favourites. I usually will try all kinds of Bak Zhang. It’s been more than 20yrs since I wrapped one. Your video is really helpful. I find your recipes here are easy to follow too. Keep it up!! Yup. Oops sorry, I meant chestnut!